This is the cover of the book about Karson’s travels. Karson with WPD Officer Jerry Popp. 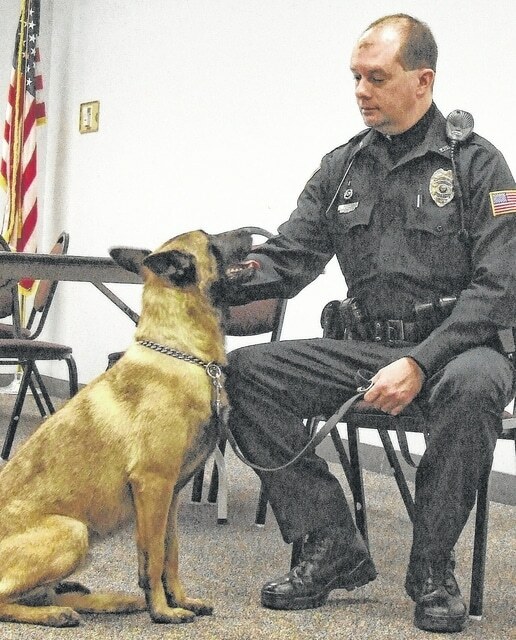 WILMINGTON — A children’s book with the title “K9 Karson Comes Home” will be released in mid-September, written by an area retired school teacher and made available by a Wilmington publishing house. The 32-page color book is filled with photographs of Karson and details of his 200-mile adventure, according to a post on Karson’s website by Wilmington police officer Jerry Popp. Popp is police dog Karson’s handler. Karson was missing nearly two months last winter before he was recovered in northeast Clinton County. The story of Karson and the community’s support to find him drew a lot of followers, and more than 900 people attended a homecoming party held for Karson. The book is written by Abbie Beam and published by Orange Frazer Press in Wilmington. For more on the story, please see the June 18 News Journal.